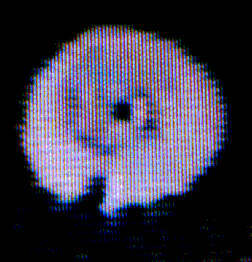 4-19-02 - DREAM FRAGMENT - I went to an upper room where I was shown a white disc - a ring with a hole in the center. 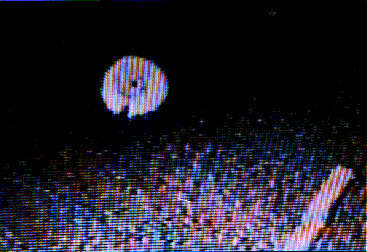 This represented a UFO. On the under-side was the propulsion system. There were 3 large shapes, which I noticed ended up in the #7. In between the 3 large triangle-spirals were 3 smaller triangle-spirals also ending with the #7 in the center. I've pictured these below, but I know they are very similar to the shape, but not exact. I also know they were trying to get me to understand that propulsion was done in 'pulses'. Tether voltages of as high as 3,500 volts were developed across the tether, and current levels of approximately 480 milliamps, or nearly half an amp were achieved, giving the science teams an indication of results surpassing expectations. This was a NASA Zero-Point Energy experiment, trying to provide future energy for the new World Space Station. The 12-mile long Tether was deployed by satellite - February, 1996 on STS-75 Space Shuttle Mission - On February 25, 1996, the Tether Experiment produced an overload of electricity and broke the Tether, severing it from the Space Shuttle. 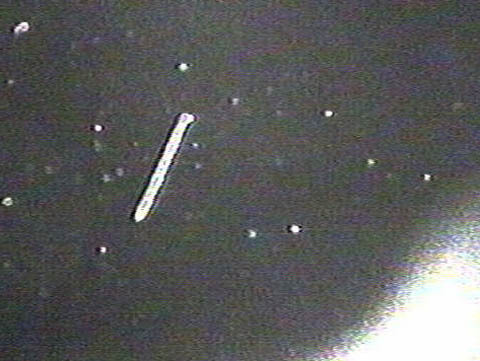 3 days later, February 28, 1996, an astounding event took place, when the shuttle and its crew were separated from the Tether and satellite by over 77 nautical miles, a swarm of UFOs flurried about the Tether and satellite as Space Shuttle Astronaut, Claude Nicollier, took video footage (using a hand-held black & white video camera designed to see into the "Near Ultraviolet" invisible to the human eye) of what appeared to be over fifty, pulsing, giant UFOs. making them "Independence Day" sized craft. The very fact that the UFOs clearly pass "behind" the 12-mile long Tether and not infront of it, eliminate the possibility of an optical illusion created when a small object passes infront of the camera relative to a far distant background object. Because the facts are clearly visible, these giant discs cannot be smaller than 2-3 miles in diameter. Many of the UFOs pulse with energy. When freeze-framed, the UFOs reveal amazing wave patterns, which have been studied by researchers. My name is David Sereda. I am the author of a new book, yet to be published, called, "Evidence 2001, The Case For NASA UFOs." In my research, I studied the cameras NASA uses to see objects that are above the magnetic frequency of the visible light spectrum. Even NASA's black and white video cameras on the shuttle can see into the near ultraviolet spectrum. If an object is only visible in these upper spectra of light, they are very peculiar. This is because any star has energy or mass visible in all known spectra of light. To only be visible in the upper spectrum gives us the signature of a very high energy object and could be why the object appears translucent. The camera that the madonna object was photographed with may be capable of seeing into the near UV spectra of light. I need to research this fact further. Also, I looked on the NASA website for LASCO and did find the image of the Madonna object as per date and time of exposure. I checked the other cameras and did not see the same image. The time of the image photograph may be so precise that the object did not appear in any other minute as the other cameras took pictures of the sun in nearby time minutes, but not at the exact same minute. This means that either the object is moving at a background speed that is very fast or that the object is only visible in the spectrum of light which the LASCO C2 camera provides. As to the rings or round disc-like shape of the object, stars or background lights seem to appear through the ring portion making the object appear translucent. 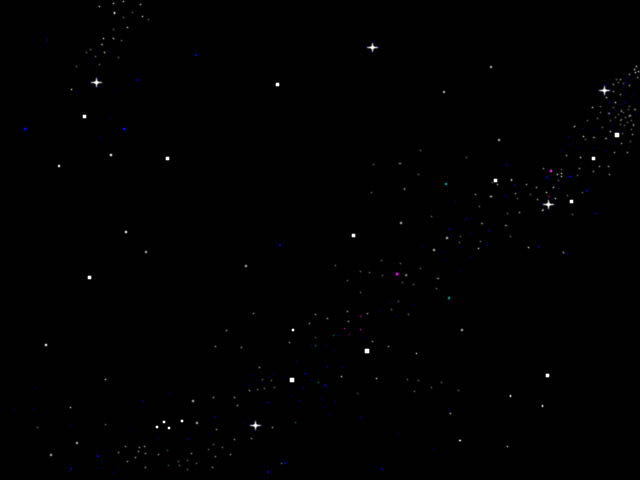 The object in the center appears to be dark and of solid mass. The ring shapes may be some kind of a magnetic field effect around the mass object caused by the interaction of the sun's radiation, which would indicate that the object has to be nearer to the sun than an object billions of miles in the distance. If this were Nibiru, it would not be moving as fast at it appears to be moving against the rleative movement of the sun, unless there is something about Nibiru that we do not know. If the solid object is moving as quickly as it appears to be relative to the sun, perhaps it could be a nearer field object between the LASCO camera and the sun. The ring-shape around the object may be caused due to the object being out of focus in the near field of the camera. But for an object to be near the field of the camera and not be nearly and completely fuzzed out while the camera's lens is focused on infinity towards the sun would seem unlikely. When camera lenses are focused on infinity towards distant objects, smaller near-field objects fade and blurr right out of the picture. Most camera lenses focus on infinity after an object is some fifty feet away from the camera. Anything after that can have good depth of field against a background object and should not produce a blurring or out of focus ring around the object. If we can verify the depth of field of this camera (LASCO C2) and know where its focal length is (I imagine this is a telescopic lens), and if it is a telescopic lens, then the object in the picture could not possibly be an out of focus near field object. This is because with telescopic lenses, a near-field object would not be visible in the lens at all. Only a slight distortion of the light bending around the near-field object would accur and that would be nearly unrecognizeable. I really think the odds are that there is something very large out there. It is moving so fast (check the frames per second on LASCO to see if the movement of this object is in real time or not) then we should all be mystified and perhaps concerned that maybe this is a passing meteor or unidentified flying object. accelerating from a near stationary hover above a given spot, like a helicopter, to speeds in excess of seven thousand miles per hour in a matter of seconds?  The craft itself was an electrical circuit. In 1989, Robert Scott Lazar claimed to have worked as a physicist at a hidden base referred to as S4 on a highly classified project involving back engineering of alien technology, antigravity and antimatter propulsion. Stanton Friedman doesn't believe him. But have scientists just proven Lazar was right all along? RNU.com – (Raiders News Update) - Yesterday, in the article, "How to float like a stone", science correspondent for The Guardian, David Adam wrote that what goes up no longer has to come down. Quoting researchers who announced their results this week in the New Journal of Physics, Adams noted that, "British scientists have developed an antigravity machine that can float heavy stones, coins and lumps of metal in mid-air. Based around a powerful magnet, the device levitates objects in a similar way to how a maglev train runs above its tracks." To make the anti gravity machine even more powerful, the team used an oxygen and nitrogen mixture to create a paramagnetic fluid. Inside the magnet, the mixture helps the objects float. US space agency Nasa notified the team that it is interested in their zero gravity research. UFO buffs may recall a man named Bob Lazar [left] discussing a similar antigravity propulsion system over a decade ago, one that he said came from aliens. Lazar claimed to have worked as a physicist on a highly classified government project, called Galileo, which involved back engineering of alien technology. The research supposedly took place at a hidden base known only as S4, a few miles south of Area 51. At the time, Lazar said he and others were working on extraterrestrial craft hundreds of years in advance of modern technology. He also claimed to have seen a total of nine different types of saucers as well as documents and autopsies of alien corpses. The saucer-type he professed to have worked on had a diameter of 9-12 m with a console and small, children-sized seats. He said he was told the aliens arrived in the vessel from the fourth planet of the binary stellar system Zeta Reticuli 2. In "On the Record" with investigative reporter George Knapp, September 12, 1989, Lazar said the alien craft flew by amplifying gravity waves through use of a reactor and an alien element--atomic number 115--an ore not found or synthesized on earth. Lazar: The technology's not even—we don't even know what gravity is! In part-one of our editorial on zero-gravity propulsion systems (with input from Stanton Friedman and Stan Deyo), we made the connection between anti-gravity advancements, Element 115, and the decade old claims by Bob Lazar. In part two of this feature we check in to see if Lazar is still sticking to his claims. RNU.com – (Raiders News Update) - In part-one of this article we referenced The Guardian's science correspondent, David Adam's article "How to float like a stone" in which he quoted researchers in the New Journal of Physics concerning the development of an antigravity machine that can float heavy stones, coins and lumps of metal in mid-air. Space Daily also elaborated on the experiment by scientists at the University of Nottingham, saying they had successfully levitated some of the heaviest elements, including lead and platinum. The research under discussion comes from the only facility in the UK specializing in zero-gravity experiments, currently being joined by various other groups in this field, including NASA. NASA's interest could be, according to some, because zero, anti-gravity, or anti-matter engines (like those described by Bob Lazar as already being available from reversed-engineered UFOs) would, among other things, revolutionize space travel. Theoretical anti-matter engines could form a source of energy capable of moving large masses, even the size of asteroids and planetoids over billions of miles. Additionally, by distorting gravity, time and space would likewise be distorted. "By doing that," Lazar says, "now you're into a different mode of travel, where instead of traveling in a linear method going from Point A to B, now you can distort time and space to where you essentially bring the mountain to Mohammad, you almost bring your destination to you without moving. And since you're distorting time, all this takes place in between moments of time." Following part-one of this special report, in which we tied Lazar's Element 115 claims to the research at Nottingham with feedback from nuclear physicist Stanton Friedman and scientist Stan Deyo, the Guardian wrote a second-parter of their own, pointing out that in 2004, Element 115 was verified along with Element 113 by a team of Russian and American physicists at the Joint Institute of Nuclear Research in Dubna, Russia, and the Lawrence Livermore National Laboratory in California. But it was the Element 115 of Lazar's claims that proposed to become the holy grail of space flight, which, according to Lazar, created anti-matter when bombarded with protons. "This anti-matter particle will react with any matter whatsoever," he said. "This, in turn, releases heat, and somewhere within that system there is a one-hundred-percent-efficient thermionic generator, essentially a heat-to-electrical generator....The gravitational wave gets formed at the sphere, and that's through some action of the 115, and the.... wave guide siphons off that gravity wave, and that's channeled above the top of the disk to the lower part where there are three gravity amplifiers, which amplify and direct that gravity wave." The "superheavy" elements, 113 and 115, named ununtrium and ununpentium by physicists, were believed to have been generated by exploding stars. According to Lazar they were created or at least manipulated by advanced extraterrestrials for space flight. Perhaps not coincidently, Scientific American had discussed "Element 115" and its peculiar periodic neighbors just before Lazar referred to 115 as an ET fuel source. 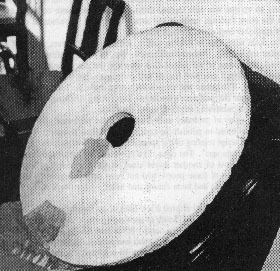 "Lazar," the Guardian article says, "who claims to have studied at the Massachusetts Institute of Technology and worked at Los Alamos National Laboratory [claims that Friedman refutes], states that his job at S-4 was to 'back-engineer' the reactor of one of the flying discs and find out how it worked. While there, he was briefed on the history of ET interaction with humankind, and watched a short test flight of the single operational craft." 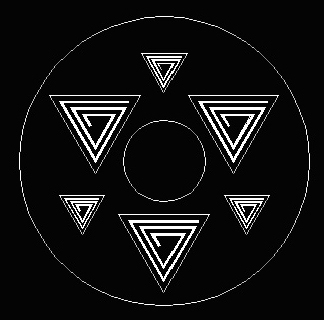 Later Lazar described the interior of this disc as being divided into three levels. The three "gravity amplifiers" and their wave guides were located on the lower level with the reactor located directly above them. Inside the reactor, Element 115 would be transmuted to unstable Element 116, decay, and release antimatter, which in turn reacted with gaseous matter, creating an annihilation reaction of 100 percent conversion of matter to energy, or fuel, enabling the extraterrestrial craft to travel interstellar distances. In this case, the amplification process generated a variant of gravity - called gravity "B", which shaped the craft's relation to gravitized space around it. ...and oh yeah, one other thing... his United Nuclear company where you can pick up a fresh supply of Radioactive Isotopes and other fun stuff, as well as go on a prospecting adventure trip for Uranium with the kids. One thing to keep in mind. If you DO plan a family outing with United Nuclear, Bob's adventure page contains strong warnings that "exploring abandon mines can be lethal for the inexperienced!" Following Stan's comments, I think I see a sequel to this article in the not too distant future. The headline might read something like: Have Scientists Just Proven Stan Deyo Right on Alien Antigravity Systems? but is a distortion of the "fabric of space-time"